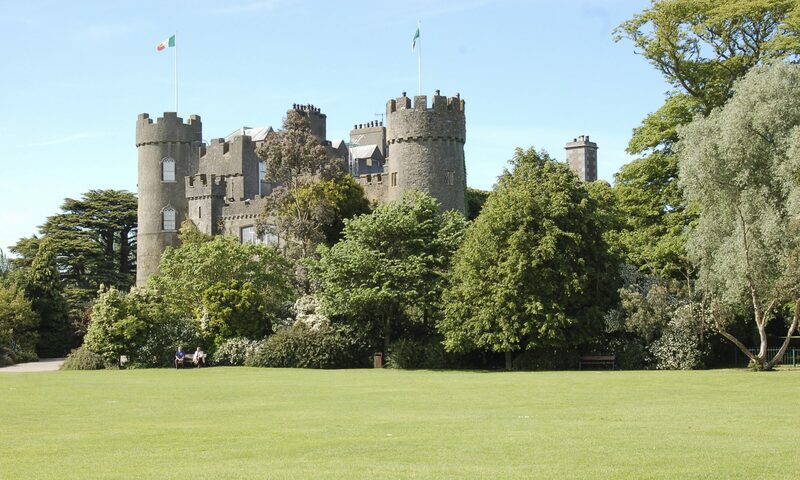 Malahide Castle was founded the reign of Henry II by Richard Talbot, who had received a grant of the adjoining lands, and was an ancestor of the present proprietor. The exterior of the building exhibits little traces of its ancient character; the old loopholes have been superseded by modern windows, the once formidable outworks have long since disappeared, and a grassy hollow is all that remains of the mediaeval castle moat. Adjoining the Castle are the venerable remains of “The Abbey,” which consisted of a nave and chancel running due east and west, and which must have been one of the finest and largest churches in the whole district of Fingal. At the south-eastern corner of the chancel is a pointed arch door, leading to a two-storied building, probably originally intended either as a vestry or a residence for the monks, but which for centuries past, has been used as a burial place of the lords of the manor.